Difficulty of this task differs from model to model, but since our model has only 2 limbs and the limbs are made from solid and sperate parts, it will be very easy to do and easy to understand. Let's start. 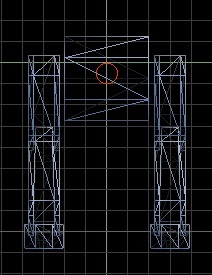 As I mentioned earlier, the skeleton consists of severeal bones, and vertices of the model will be attached to that bones. 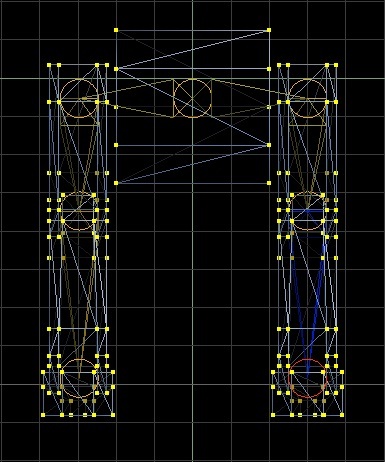 And instead of moving every vertex for each frame of animation, we will assign them to bones and rotate these bones. 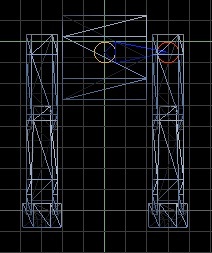 This may look like an extra step opposed to vertex animation, but in complex models it is alot easier to animate this way. Nearly all big game titles uses bone animation for characters,monters and othervariety of models. 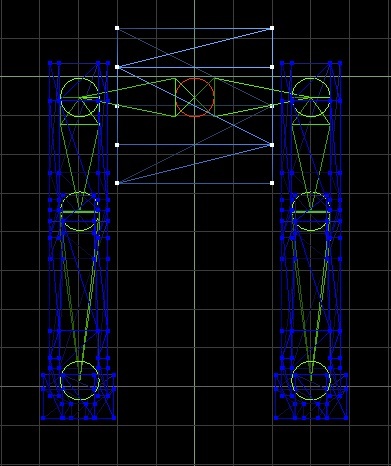 We will first build the sekeleton then attach vertices to bones. First, go to Bone Mode by clicking the Bone Mode icon from the toolbar. The bone toolbar at the bottom of the screen that is normally inactive will become enabled. Grayed out buttons will become colored. A circle will appear. This is your first bone! If your circle is too big or too small you can change it's size by going to File -> Preferecens -> Misc and changing the Bone Size value. You see how the one of them is blue and others have yellowish color? Yellow ones are normal, unselected bones, the red one is our selected bone. And the blue color indicates the connection to "parent" bone. 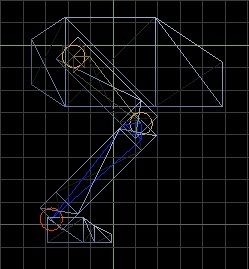 It means if you rotate the bone at the other edge of the blue colored part, your currently selected bone will also rotate. This can sound kind of confusing, but it will make great sense in 10 minutes. The color of the bones of the leg is changed, it's white by default but i changed it to green since it's a little hard to see from the edges. This indicates the "child" bones, it means that if you rotate this bone, all the green bones will rotate too. Now, you are going to repeat the same steps for the other leg from side view. There is bones of the first leg on the view, but no problem! You can either hide them or use them as helpers for your new leg! Just click on the center of the bone circles of the first leg(watch the front view while doing that), and the bones for your new leg will be added. We have a skeleton, skeleton alone does not mean much. 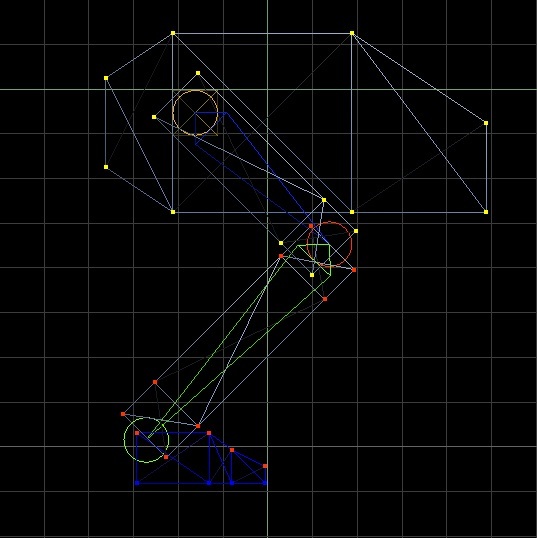 Bones do not know which vertices they should move with themselves. We are now going to tell bone which vertices they should move. 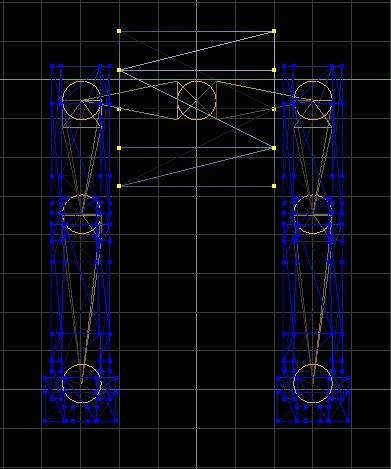 Again complexity of this task changes from model to model, but since our robot model has very few and only solid parts it will be both easy to do and understand. If you are not already in Bone Mode, switch to Bone Mode . 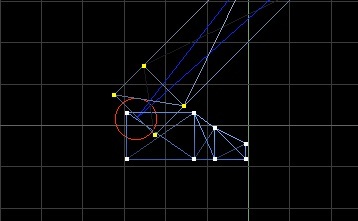 Then from the bone toolbar click on the Apply Vertices Mode button. Double-clicking to an empty place will deselect the bone. 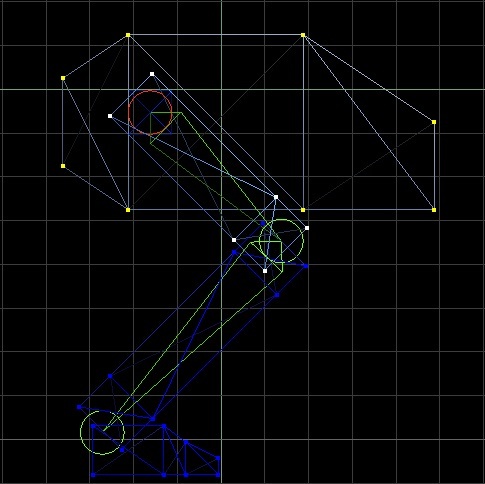 While no bone is selected, you cannot select vertices. Nice! 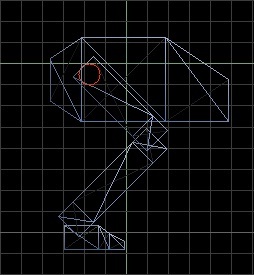 Looks like I only selected the vertices of the feet. If you are sure that you selected a bone and correct vertices to attach to it, click on the Apply Vertices button from the bone toolbar. 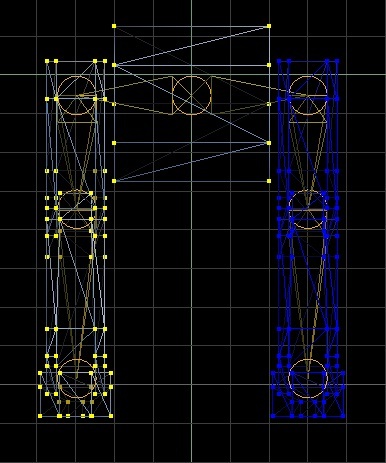 Vertices will get assigned to the bone and their color will change. The adges that will be affected of movement and rotation of that bone will also change color. If you figure out you accidentally attached vertices you did not wanted to, select these vertices and click on Remove Vertices button. 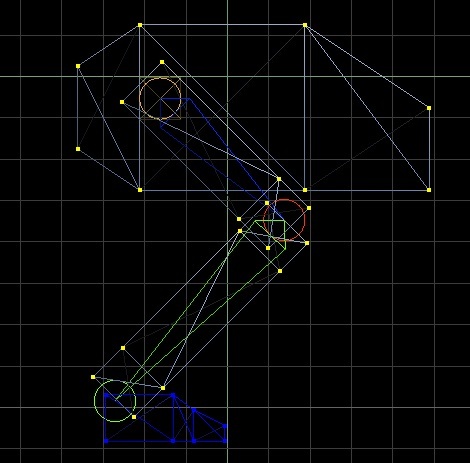 This will de-assign the selected vertices from the bone and vertices will change back to their original color. Now go ahead and select the knee joint. 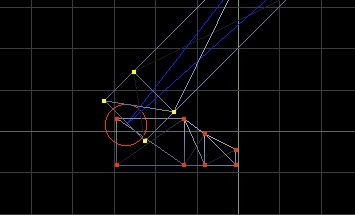 Note that you can deselect currently selected bone by double clicking on an empty space in viewport. 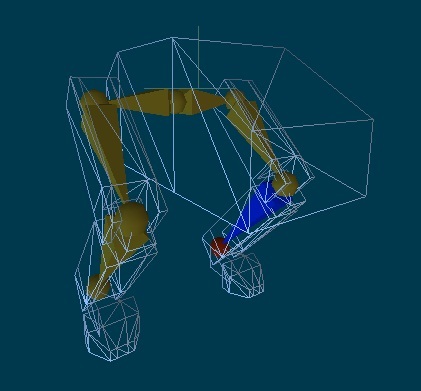 You will notice that the color of the vertices attached to feet bone will have a different color. 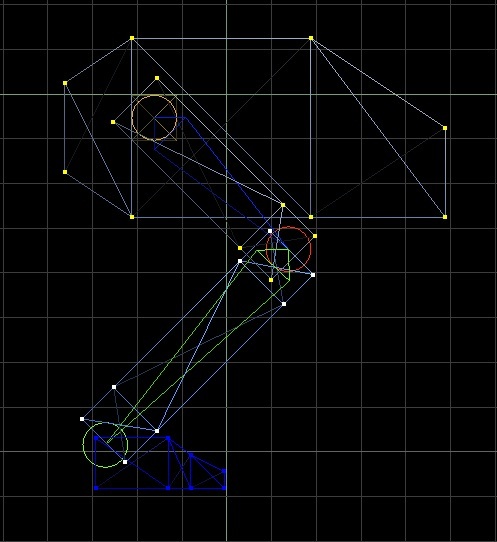 This indicates that these vertices are already attached to some other bone other than the currently selected one. 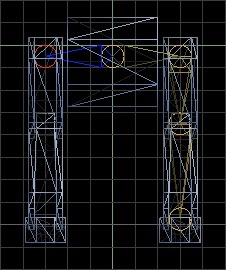 Note to users with other 3d animation software experience: The Acknex Engine DOES support vertex weigths(assignin vertices to multiple bones). This is just the limitation of the MED, in which you can only assing a vertices to a asingle bone. Now attach the vertices of the upper leg by using the methods explained above. One of the legs is finished. Repeat all steps above for the other leg. Then attach the remaning body vertices to the bone in the middle of the skeleton. Done! We attached all vertices to bones and we are ready to animate the model!